Cone Hats can be difficult to wear, especially if the elastic string bothers your chin, but there is a solution! Try on this Assorted Cone Hat Hair Clip and wear it to a New Years Eve party or even a birthday party. This hair clip has a plush red cone hat attached covered in a satin fabric with gold, black and red ribbon and gold foil bursting from the top. 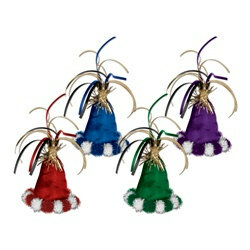 The brim of this Assorted Cone Hat Hair Clip is made up of metallic pom poms. Because it is a hair clip rather than a real cone hat, it will definitely stay on your head as it is attached to your hair. Wear it on top, or wear it angled on the side for a fashionable twist. Make sure to check out all of the hair clips we offer to find one for every occasion.